Sorry things have been a little quiet, uni work has most definitely been my priority, but I have some gorgeous pieces I want to share with you over the next week or so, so I better get on with it! Last week I was in London for an event, and with the afternoon to spare, I thought I'd organise to pop in and see the team at Scarlett and Jo. I am always bowled over by the creative team's enthusiasm for creating a very feminine atheistic, mixed with bold colours and prints. Gifi, the big boss, always calls me his 'casual girl', he knows that I'm not necessarily what you might class as Scarlett and Jo's prime customer base, I'm far too happy and comfortable in jeans, but what I do know is, that if I want a beautifully fitted, vintage inspired piece, Scarlett and Jo is always my first port of call. I was sent this tea dress a couple of weeks ago now. I'd been wearing it all day (albeit with flat shoes! 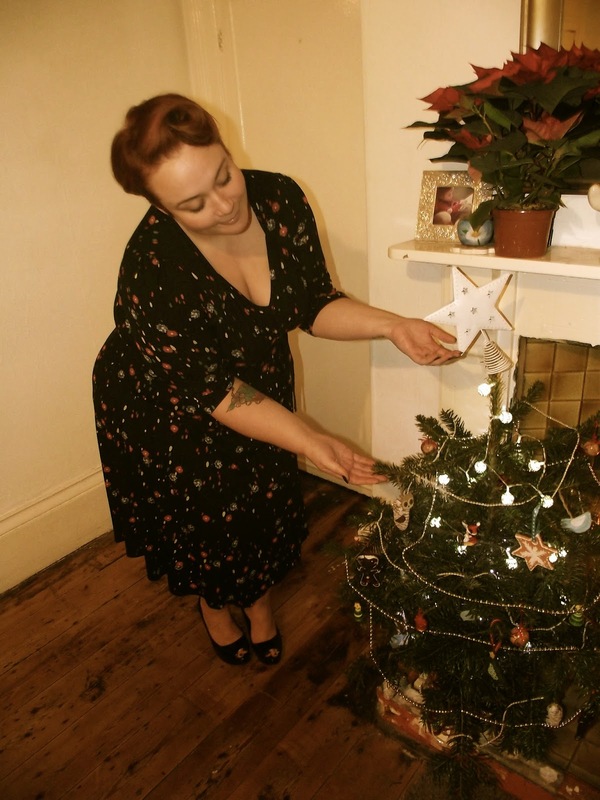 ), we'd just put our decorations up in the living room and I thought I'd get a few pics of me in it. I apologise in advance, they are hilariously cheesy, but everything looked so twee and pretty, I couldn't resist! 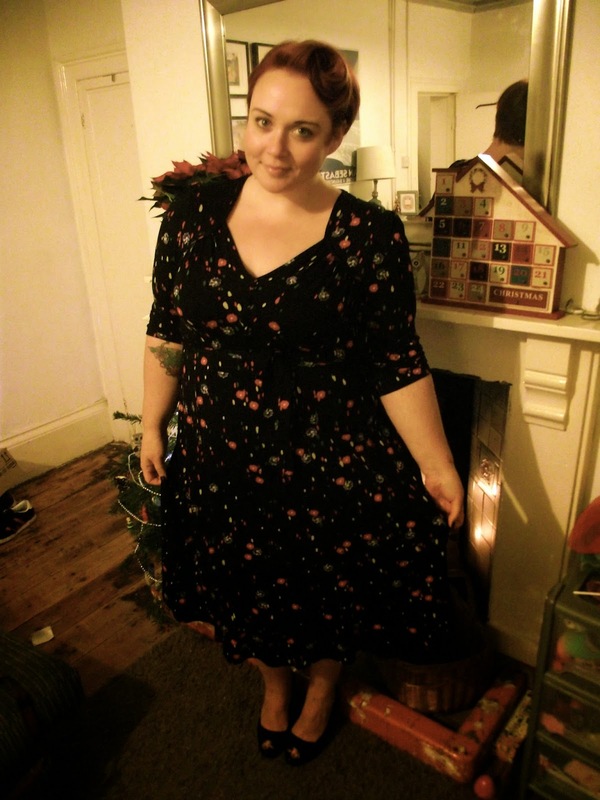 Now forgive me, I look dog tired, and most probably should have slapped a tonne of make-up on before I did these shots, but I'd had a long day and I wanted to share this dress with you, especially as it currently has a whopping 30% off. Look I even sepia-toned some of them for that authentic vintage look! Ha ha! (I told you it was cheesy). 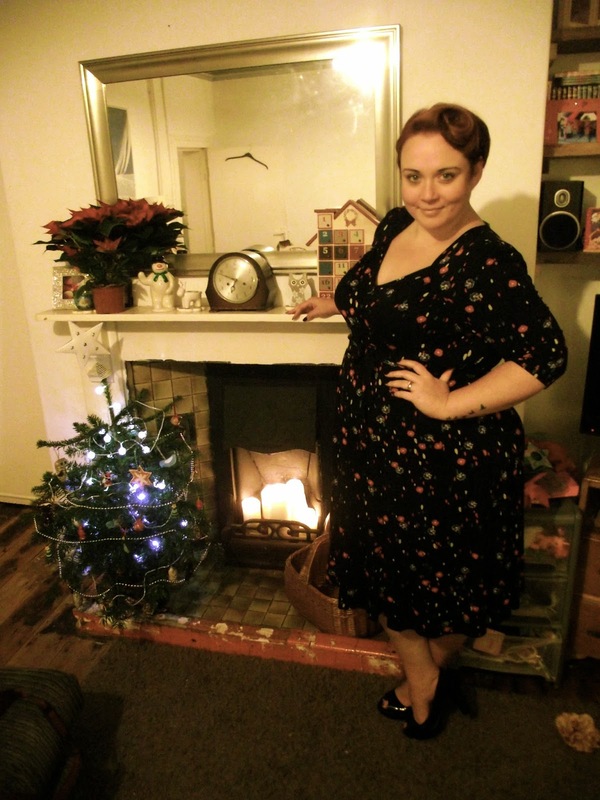 The dress is that beautiful heavy jersey that S&J do so well, it always hangs so well and has a lovely stretch to it. The 1940s detailing in the neckline is just stunning, the scalloped shoulders, with light padding and button detail to the chest make this dress so special. I'm wearing the 24 but the 22 would have been just as good on me. I find I fluctuate between the two sizes in S&J. I have a couple more casual, contemporary pieces to show you from Scarlett and Jo, and having seen a sneak peak of the newest collection, I can tell you now, there is a whole world of beautiful coming your way very soon. Also a quick thank you to Scarlett and Jo for having myself, Elena and Em over last week, we had a wonderful afternoon and can't wait to pop in again! Looking fabulous - wish I looked such a starlet after putting up the christmas tree! A curvy girl's Island Adventures ... monkeys, prints, and a wonder bikini! I wish I looked like this after putting up the tree too! I tend to always up looking like a sweat riddled crazy person, the only difference each being that one year im in pjs the next in trackies! Oh the glamor! Eeeps! So cute!! I love this as a photo set idea!